If you have not read Our Adoption Saga  2017, please do so. These two stories are tightly intertwined involving many of the same people and places. Once we left Oklahoma City with Madison's adoption decree in hand, Brenda and I thought our adoption adventures were over and we could get on with our lives and raising Madison. We would have liked to have another child but we rarely discussed adopting again because neither of is wanted to expose ourselves to the heart-wrenching drama that characterized the previous year. Nevertheless, we soon found that even if we did not actively pursue adopting another child, the circumstances of another adoption were going to pursue us. Our allowing the birth-parents and family to see and interact with Madison has reaped huge benefits as the following will attest. One of the most harrowing thoughts of many birth-mothers is the thought that they would never see their child again. After we returned back home to WV, our lives were getting back to normal. No more concern about adoption matters or dealing with lawyers, courts, social workers, and coming up with finances to cover it all...until Brenda received a life-changing text. Madison's birth mother texted Brenda one evening in May and said she was pregnant again from the same father as Madison and asked if we would adopt this child also! Brenda and I were shocked. "She is pregnant again so soon after having Madison?" This would be a full sibling to Madison so how could we say, "No?" We knew this would involve supporting the birth-mother for several months until birth and strain our finances, but we looked on this as another gift from the Lord and agreed to adopt. The birth-mother told us she "felt" this baby would be a boy and wanted us to have him so Madison would have a brother. She also knew she could watch them grow together and see them on occasion. We contacted our Oklahoma attorney and she started the paperwork and financial arrangements for us to adopt. One item that is required is proof of pregnancy. Either a statement from her doctor, clinic, or other proof. The birth-mother had not been to the doctor and seemed hesitant to go. Finally, Brenda suggested the birth-mother get an ultrasound to both prove her pregnancy and determine the gender of the baby. The birth-mother agreed and Brenda set up an appointment. When the day came the birth-mother had a friend drive her to the office and she had the ultrasound. It showed a healthy boy about 15 weeks along. The ultrasound office sent us a video of the ultrasound plus a recording of the baby's heartbeat in a little toy bear. We were satisfied and happy. However, the boy was not due until November, and that was a long time away. In June the attorney had all the paperwork and court filings approved and found the birth-mother a little house we could rent for her. So we sent the monthly expenses and waited. During the next few weeks, however, the birth mother became more aloof and distant and would not communicate with Brenda except very sporadically, and even then she would not say much. Then sometime during the last week in June, 2018 we received a shocking message from her that simply said, "I have decided to give the baby to someone else, sorry." We knew something was going on with her but did not think it was this extreme. Also, what she wrote did not sound like her...it sounded like her sister, birth-mother 1 (in our previous article) the one who promised us her baby and then kept it but then directed us to this birth-mother and Madison! Brenda texted and called both the birth-mother and her sister but could not get an answer or reply. We were in the dark as to what was going on and once again, heartbroken. It seemed very natural to us for a birth-mother give a child to parents who have already adopted a full sibling to the child, and all along this is what the birth-mother said she wanted. But something was amiss and we couldn't find out what...then a couple weeks later the birth-mother said she had actually lost the baby in May and was afraid to tell us but she was now pregnant again by another man. This didn't add up at all. The dates wouldn't work. We were thinking she never was pregnant, but what about the ultrasound? Then a few weeks later another event occurred that added a whole new dimension to what was happening. One day in July Brenda received a call from Oklahoma from a number she didn't recognize and she answered it. The anonymous caller told Brenda that the little girl we were supposed to adopt from birth-mother 1 (Madison's aunt) the year before was now in CPS custody and they were not going to give her back to the mother. The caller went on to say we had a good chance of getting her since we were supposed to have adopted her and had signed papers. This information was a surprise. What are we to do? We decided Brenda (with Madison) should fly to Oklahoma and see what is actually going on. Once in Oklahoma Brenda talked to everyone she could who was involved, even the two BM's family (remember they are sisters). While visiting the two BMs, their brothers, and mother, they were all impressed with how well Madison looked and behaved. They could easily see how much Brenda loved her. When she was introduced to the various people present, Brenda found out the girlfriend of one of the brothers was pregnant with a boy, around five months or so along, and then Brenda thought, "Hum...is it possible...maybe...just maybe this is the baby in the ultrasound!" Brenda found out there was a hearing scheduled the first week of September on the little girl's CPS case (she was now 13 months old) and we needed to be there if we wanted to try and get the poor girl out of foster care and give her a home. So Brenda and Madison came back home and we decided we would go to the first hearing which was a few weeks later and see where we stood. We had actually given up on adopting the girl the year before when the mother kept her, but the Lord brought us back in the picture for reasons of His own and all we could do is go back to Oklahoma and see what happens. We did not want to hinder anything the Lord may be doing. In the meanwhile, a couple weeks before we were to leave for the Oklahoma hearing, Brenda received a profound text from the pregnant young mother she met just a couple weeks before. The mother simply asked, "Would you adopt my baby?" This was an unexpected surprise and shock to both of us. Instead of us pursuing another child, because of our willingness to allow the birth-family to see and interact with Madison and our obvious love for her, another member of that family wants us to adopt her little boy! The father, Madison's uncle, agreed as well and even encouraged the adoption. He said Madison needed a little brother and the little boy would need her. Of course, we agreed to adopt, but this all sounded too good to be true and too easy. I will admit I was pretty skeptical. We had been "burned" so many times before, most recently by Madison's BM, that it was hard to get our hopes up very much. Brenda told the new birth-mother that we were coming to Oklahoma the first week of September and we would like to meet with her and talk things over. The birth-mother said she happened to have her final ultrasound scheduled that week in Tulsa and invited us to attend. We said we would be there. We flew into Oklahoma City in September for the little girl's hearing and it was a typical juvenile court hearing little different than those we have seen in WV when we did foster care. No one knew what was going on. The appointed attorneys for the mother and child, the prosecuting attorney, CPS workers, and judge had almost no idea what was going on. Our attorney knew the facts of the case better than anyone there but no one would listen to her because she represented this "out-of-state" party who think they can come to Oklahoma and "take back a child." As usual with these CPS cases the "left hand doesn't know what the right hand is doing" and almost nothing is resolved. The attorneys stand up and talk like they know what is best for clients they don't know and wouldn't recognize if they met them on the street. The clients are just part of a case number on a docket. Although we hoped for a better outcome, the hearing was "continued" to a later date after about 10 minutes and we were asked nothing nor was our attorney. We traveled over 2000 miles out and back for 10 minutes of nothing. After talking to our attorney and others involved we learned almost no one in the legal system wanted the little girl to leave Oklahoma (except the birth-mother who NOW wanted us to have the girl to get her out of foster care) and our pursuit of her would almost certainly be futile. So we dropped out. More time, money, and concern down the drain. However, as mentioned above, we were in Oklahoma for another reason as well, the ultrasound of the birth-mother with the little boy she wanted us to adopt. Her procedure was the same day as the little girl's hearing, but in the afternoon. So as soon as the hearing was over we rushed to the car and hurried to Tulsa and met the birth-mother at the clinic. She was nervous and so were we, but Brenda made her feel at ease in no time. That is one of Brenda's gifts. Her charming personality draws people to her and makes them feel comfortable. Soon we were in the ultrasound room viewing the "perfect" little boy who was now over 6 months along. The birth-mother told the doctor we were the adoptive parents and they gave us a copy of the scan. Then when all was over Brenda asked the birth-mother a question that had been on our mind for weeks, "Did you go for an ultrasound back in May pretending to be Madison's mother." The birth-mother shyly replied, "Yes," and said she felt bad about doing it but wanted to help her potential sister-in-law. Now it all made sense. Madison's birth-mother was in a financial bind with no place to live or means of support. We supported her for six weeks after Madison's birth, but that time had passed. Her sister (the one who defrauded us with the little girl the year before) told her that she could get money like she does by being pregnant or even claiming to be pregnant and then going through an "adoption facilitator" she uses in California to get potential parents to pay her expenses. Then all she needs to do is say she lost the baby or is keeping it and there is nothing anyone can do. Madison's birth-mother out of desperation reluctantly agreed to this scheme but could not actually do any of the acts herself. She let her sister, who is more bold, do it pretending to be her. That is why we thought some of the texts we received were suspicious. Madison's birth-mother told us first she was pregnant and when Brenda asked for a doctor's report or ultrasound she out of desperation asked her then 3 month pregnant "sister-in-law" to pretend to be her. After this ruse Madison's birth-mother began feeling more and more guilty and refrained from communicating with us. Eventually, she had her sister text to us in her name she was dropping us. She could no longer live the lie to us and take money from her daughter's family. However, following her sister's advice, she did let her sister contact the facilitator in her name and get her another family to pay her instead. What happened to us during the Spring and Summer of 2018 could only be called a miraculous turn of events engineered by the God of Heaven! The very baby that was used to defraud us by one person is now promised to us by the true mother! Sometimes truth is stranger than fiction. The next two months were a waiting and paying time. We had our attorney draw up all the legal papers again and get it all approved by the court, and we paid the mother's expenses for rent, phone, food, clothing, etc., hoping there would not be any more heartache. The mother seemed very content in giving us the child and then in the middle of Nov. about two weeks before the due date she started having pretty sharp pains and was beginning to dilate. We left home a few days earlier than planned and spent the next two days driving to Tulsa. Fortunately, the BM's pains subsided and when we arrived she was still at home waiting to deliver. The next day we went with her to her doctor's appointment and she said she could deliver any time, almost certainly withing 3 or 4 days. 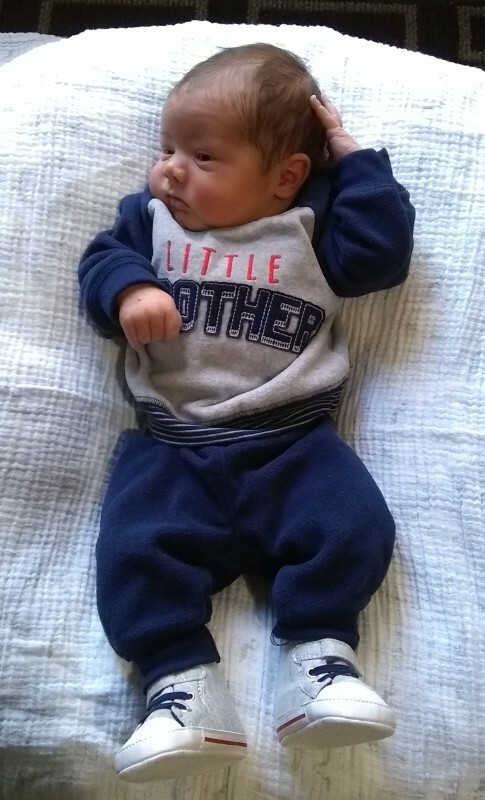 Then 3 days later, on Thanksgiving Day, 2018, she delivered a baby boy at 5:05 am, weighing 7 lbs 12 oz. Little Mason Aaron Morton had to go into the NICU because some of the drugs they had to give the mother during delivery caused him to not be able to bring his temperature up and maintain it. Also, his sugar level was low plus he developed jaundice. Furthermore, the birth-mother had Postpartum Depression with her other births and she was showing signs of it again soon after Mason's birth. As mentioned before in our account of Madison's birth, the birth period can be a very stressful time for adoptive parents. The whole process is stressful, but for us the days immediately after birth are the most difficult and uncertain. It is always in the forefront of our minds that we are there ONLY at the pleasure and desire of the mother, and if at any point she changes her mind and wants us out, we could be out in a moment. Furthermore, with a birth-mother who has Postpartum Depression, the uncertainty is even greater. The birth-mother did not want to see the baby immediately after birth but someone at the hospital failed to inform the doctor of that key fact and he laid the baby on her belly right after he was born. She quickly told them to take him away, and the nurses who did know we were adopting the baby gave him to Brenda. Soon after we were on a different floor from the birth-mother so she would not accidentally see Mason until she was ready. Brenda went to see the birth-mother several times a day and it was clear the depression was working overtime, but, thankfully, the birth-mother never once hinted she was going to change her mind. The day she was released she went to see Mason in the NICU and with tears said her goodbyes. Giving up a child for adoption is understandably a very difficult time for many BMs. Some can't go through with it, but many do, and now two of our BMs did. Mason recovered from his issues quickly and three days after birth he was released from the hospital in our arms! What a blessing from the Lord. In less than a year after multiple heartbreak and pain the Lord has given us two newly born children to raise and call our own. Madison was our "Christmas Miracle" and Mason our "Thanksgiving Miracle." Because of some adoption abuses in the past, Oklahoma now requires the birth-mother giving her child up for adoption to go to court a few days after birth and verbally relinquish her rights to the child and name the adoptive parents as the new parents. This is scary for many mothers for multiple reasons. Some of them have been in trouble with the law before and do not want to be near any judge or courtroom. Some have pending fines and charges or no drivers license and are afraid if they show up they will be arrested. And others are just scared of being the center of attention and asked questions by a judge, especially this soon after birth. In many ways this is the most important action of the whole adoption process. The mother MUST relinquish in court or there is no adoption. In Madison's case the birth-mother said she was not going unless the father went as well. We said by all means let him go. In Mason's case the birth-mother was depressed, aggravated, and lashing out to almost everyone. When it came time to go she said, "I'm not going tomorrow. I have a job interview at the same time and I'm not going to miss it." Our attorney had to "beg" to get a court date so soon and said there was not another opening until 2019! The birth-mother HAD to go that day or we were in a royal mess. We could not leave the state with Mason. Brenda and I were both "walking the floor." Brenda called and texted the birth-mother with no reply. Both of us, our attorney and the BM's attorney were quite anxious. Brenda, and I prayed together in the motel room and then Brenda decided to call the grandmother she just met and tell her what was going on. She told her about the bad situation it would cause us and Mason if her daughter did not go to court. The grandmother said, "I'll call her. She needs to go." An hour or so later (it seemed like many hours) the grandmother called back and said the birth-mother would go. This was some relief, but the birth-mother was in Tulsa and the grandmother in Okla. City. There was no way she could be close by to reason with her in person. Finally, after another hour or so the birth-mother texted Brenda and said she would go but felt like she was being coerced to go that day. It appeared her Postpartum Depression was in full swing. That was not good because the purpose of the hearing was to determine if the birth-mother was relinquishing without any coercion. Our attorney (actually us) provided a driver to take her to court the night before and put her up in a motel so she could be close and on time. The driver called the birth-mother and said she was on her way to get her and the birth mother said..."I will be ready." This was a little more relief for us, but it is not done until it is done. It is easy to worry about all the things that could happen, especially with someone who is not emotionally stable at the time, but in the end her mother showed up at the courthouse and comforted her and she relinquished before the judge. 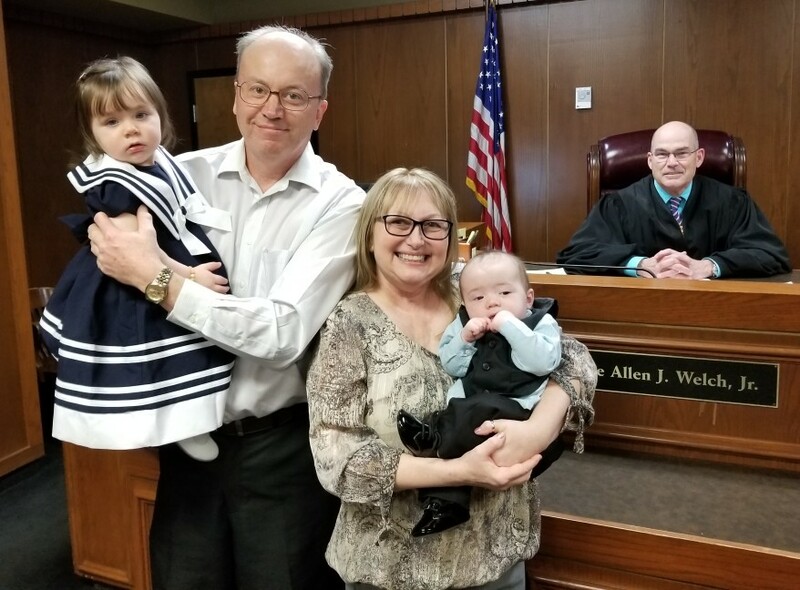 Our attorney said she choked up and the judge was kind to her and gave her time to calm down, and then she gave little Mason up and named us as his parents! Praise the Lord! The birth-mother dearly loves her son but knew she could not care for him and give him a life he deserves. This takes a great deal of love and courage and we very much admire all birth-mothers who give their children up ...but we admire our two BMs most of all. After a couple months at home our social worker prepared a Post Placement Report on Mason. This is a required report on how the adoptive child and family are getting along and to verify the child is progressing as expected. The social worker gave us a positive report and recommended the adoption be finalized. We sent the report to our attorney and once she got most of the legal loose ends completed in Oklahoma she got us a finalization hearing for April 1. So we bought our airline tickets and packed our bags one more time for Oklahoma. About a week before we left the attorney said there was a new problem to deal with. In Oklahoma all the financial dealings between the client, attorney and adoptive parents must be examined and approved by the Public Defender. This is really just a legal formality but our attorney said the previous Public Defender who routinely approved them died and a new "gung ho" attorney took his place who has denied approval and forced an uncommon "expenses hearing." The birth mother of Mason had lost some of the receipts she was supposed to turn in and our attorney was afraid this may delay the finalization and cause the additional hearing. Instead of the adoption being granted, we would have to testify at another hearing that we paid her a certain amount of money and are willing to waive the payments because of the lack of receipts. Basically, it was just legal bureaucracy. Our attorney suggested if we could hunt down the birth mother and get her to sign an affidavit that she lost the receipts that may help. So Brenda called the birth mother and got her together with the attorney and the paper was signed and submitted. This was three days before we were to leave. The day we left for Oklahoma we still didn't know if the Public Defender would approve the expenses, thus we were not sure if Mason's adoption would be finalized. If it wasn't, it would be a huge letdown and pretty much wasted trip. We were very much looking forward to having it all complete. The morning of the hearing (Mon., April 1) we still didn't know. So, hoping for the best, we got all dressed up at the motel, got in the rental car, before we left prayed to the Lord that He would take care of it all, and drove to the Oklahoma County Courthouse in downtown Oklahoma City. We were about an hour early and after we parked the car we just stayed inside a while watching all the lawyers and clients milling around the courthouse. After a few minutes Brenda's phone dinged with a message. It was from our attorney and she said, "The PD approved the expenses. We will be finalizing Mason today!" We were all elated, and within the hour we promised the judge we would care for Mason as if he was our own, took a few pictures, and the finalization was over. The day after we packed our bags and came home. (The kids were restless at times on the flights, but for the whirlwind trip we took they did very good.) We all came home exhausted. It had been two years and four months since we actively pursued adoption a child, and in that time span the Lord blessed us with two. During that time it seems like much of mine and Brenda's lives have been put on hold seeing how these adoptions were going to go. No matter what stage in the process we were in there was always something ahead of us that had to be done or we had to wait on. When we think back over the weeks and months we wonder how we got through it all. But now everything is complete and our lives are complete. From now on our strength will go toward raising these gifts from the Lord for His honor and glory. Non-family adoption is a tough process for everyone involved, especially if it is in another state. It is very stressful on the birth-mothers and birth-family (at least many of them); very stressful on the adoptive parents; and even stressful on the attorneys (at least the good ones). However, the love and care of children drives the whole process. The birth-mother/family loves them because they let them live and want the very best for them even though it breaks their heart that they can't care for them; the adoptive parents love them sight unseen and want to raise them as their own; and the good attorneys love them by making a match possible and caring for the others involved. If anyone reading this chronicle is thinking about adopting a child, be forewarned by what you just read. But also be encouraged by the potential results. There is nothing like holding a child in your arms that looks to you and only you and your spouse as parents. To hear them truly call you "mommy" or "daddy" is a precious blessing not all get to hear. If you really what a child then go for it, in spite of the potential failures. As has been said, "Nothing ventured; nothing gained," and there is very, very much to gain. While changing planes at the airport to come home from Mason's finalization, Brenda took Madison and Mason to the restroom to change their diapers. A couple minutes later, through the noise of the crowds and shuffling of people, I heard this little girl's distinct voice yelling "Da-ee," "Da-ee," and saw this little girl frantically looking from side to side trying to find her daddy. When her eyes finally met mine she smiled a big smile and then said in a delicate little voice, "My Da-ee," My Da-ee." If words like that don't melt a man's heart, he has a heart of stone. As we mentioned adopting children is expensive. Sometimes very expensive. In fact, the high expense is a main factor why many who wish they could adopt can't. They just can't afford it. Again, if it was not for the funds Brenda and I received from our father's deaths, we could not have pursued an adoption. Also, as we have detailed, not every potential adoption is successful, but whether successful or not the expense is about the same. Before we adopted Mason with three failed adoptions and one successful, Brenda and I had spent many thousands of dollars, with more money going toward the failed ones than the successful one. By the time we found out we could potentially adopt Mason, we were wondering how we would pay for it without resorting to drastic measures such as a loan or weakening our retirement. In the meanwhile the Lord had another plan. He sent a storm and a tree. Storms with their wind, rain, and potential destruction are usually looked on with a negative light, and with good reason. However, in our case in the summer of 2018 a loss was turned into a blessing. One day in August, around the same time Mason's adoption was coming together, we had a severe wind storm here at home. The storm generated a few pockets of little "twisters" that coursed through the woods taking down trees in its path. These were not true tornadoes, but smaller cyclonic currents that were still quite destructive. One of these mini cyclones went right beside a rather large metal "shop" building my father had built around 30 years earlier. The wind blew down about six large trees beside the building and a mid-size hickory that was among them hit the building. It started at one end and slid almost to the other end bending and breaking as it went. However, the building remained standing and nothing stored inside was damaged. When I went over and surveyed the mess, I was discouraged. Here was a busted up building I needed to fix plus a bunch of trees to cut off the top of it and around it. Then I wondered if maybe we had some insurance coverage. I checked the policy and it said it had a certain amount of coverage on out buildings. So I called the agent and got the ball rolling. The agent told me to take some photos and send them to him. I did and waited. A couple days later he called and said over one-half the building was damaged and they would pay to replace all the metal and broken structure, plus pay for the labor to clean up the trees. We were surprised and elated. When we got the check a couple days later it was almost exactly the same amount it would take to get Mason's adoption completed. What an unlikely blessing! Yes, we still have a beat up building, but we also have a wonderful little boy! What a God we have! Decades ago he prepared a tree to grow in a certain spot, and that day He formed a wind to blow it down in a certain way. All so it would be easier for us to get our darling little boy!